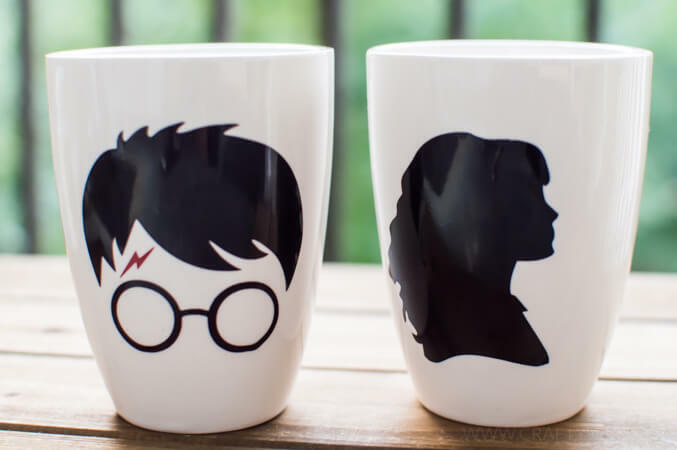 Hey Harry Potter fans! 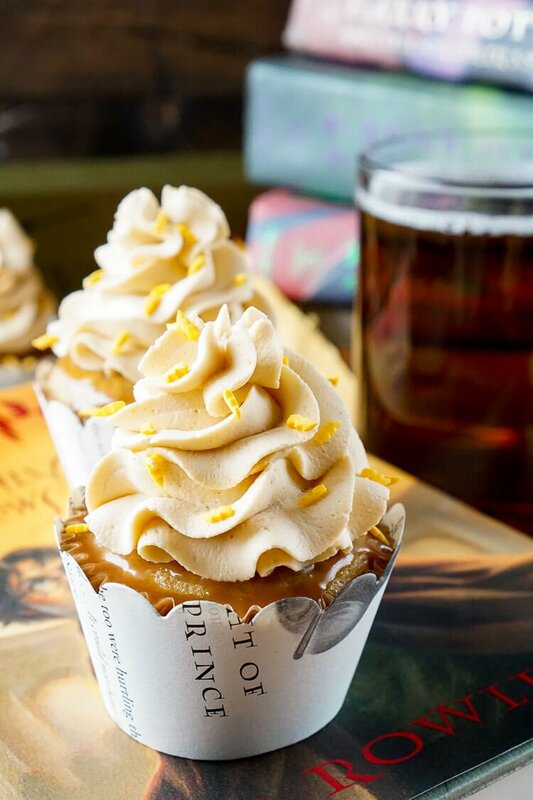 If you love butterbeer, you are going to love this cake. It’s a butterscotch cake with a browned butter frosting, and Spiced Molasses Butterscotch sauce drizzled over the top. YUM! Of all the cakes I’ve made from scratch, this one has the best crumb. It is fine, and soft, and delicious. The cake itself isn’t too sweet, because I knew the frosting and butterscotch sauce were going to be sweet. So with all those three elements combined, it’s just perfect. And who can resist the sauce running over the edges?! Not me! I think it adds to the beauty , and slightly dresses up a simple cake. Plus, there is more of that sauce between each layer of cake along with the frosting. The recipe for the cake is below. 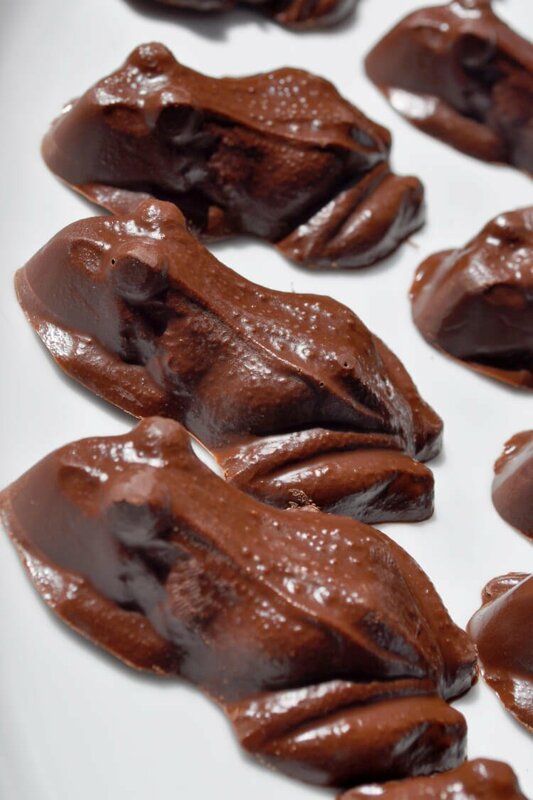 The recipe for the frosting is in it’s original post. And the recipe for the Spiced Molasses Sauce is here. 1/4 cup oil- vegetable, canola, etc. In the bowl of a stand mixer, I use my whisk attachment in my Bosch, mix the flour, baking soda, baking powder, and salt- just til combined. Then add the sugar, and mix again. Add the soft butter to the flour and turn the mixer on low/ medium until the mixture is similar to sand. In a separate bowl, mix the eggs, vanilla, molasses, and oil. Add those to the flour mixture and mix on low/ medium speed until combined. Scrape down the sides of the mixing bowl with a rubber scraper. With the mixer on low, slowly add the buttermilk. Mix until smooth, scraping down the sides of the bowl when needed. Divide the batter evenly among the three cake pans. Bake 25-28 minutes, after 25 minutes -and if the cakes aren't jiggly in the center- lightly touch the tops of the cakes and see if they spring back. If they don't, you can test them with a toothpick to see if they are done. If they don't spring back, bake for a few more minutes then test again. Once the cakes are baked and out of the oven, let them cool upside down on a wire rack, in the pans for about 5-10 minutes. Then invert the pans, loosen the edges if necessary and remove the cakes from the pan. Peel off the parchment paper from the bottom of the cakes, and let them cool completely. If the cakes are domed, you can level the tops by carefully cutting them off. Put a dab of frosting on your cake plate, then add one layer of cake. 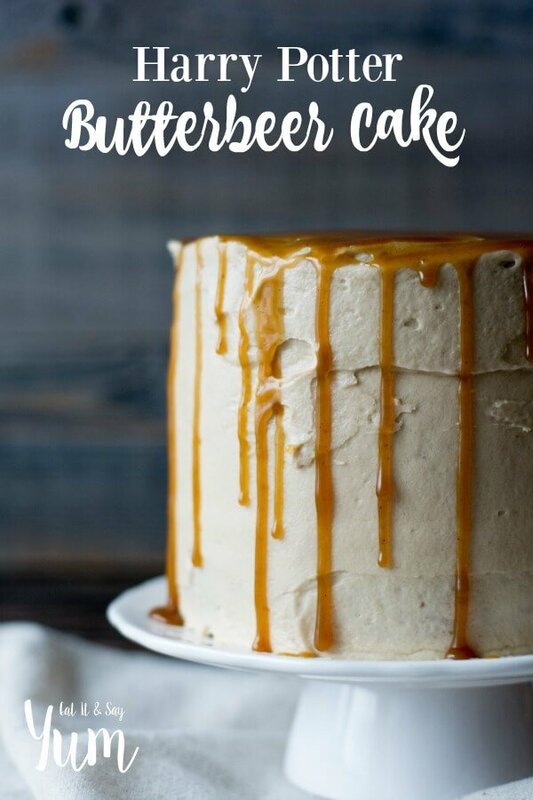 Spread frosting over the top of the cake, then drizzle the butterscotch sauce over the frosting. Repeat with another layer of cake, frosting, and sauce. On the last layer of cake, spread frosting over the top and sides and smooth around the edges and top. Drizzle more butterscotch sauce over the top of the cake, just enough to cover the top and let some drizzle down the sides. 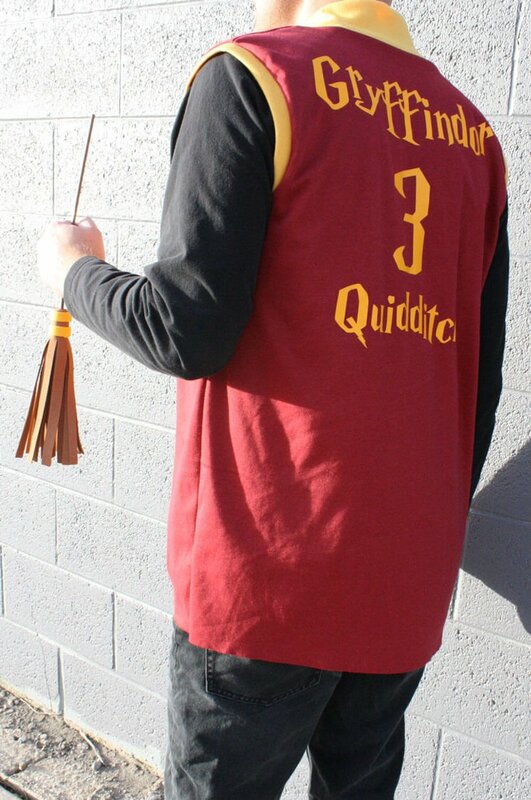 Don’t forget to check out these other great Harry Potter ideas! I want to make the Butterscotch Cake but noticed you use oil in the wet ingredients but it’s not listed in your ingredient list so wonder how much oil? I assume you used vegetable oil? Look forward to hearing back. I made this cake today for my daughter’s HP themed birthday dinner. It is divine!! Thank you for this recipe. It’s going in my collection. Thank Yukiko! I’m so glad you liked it! 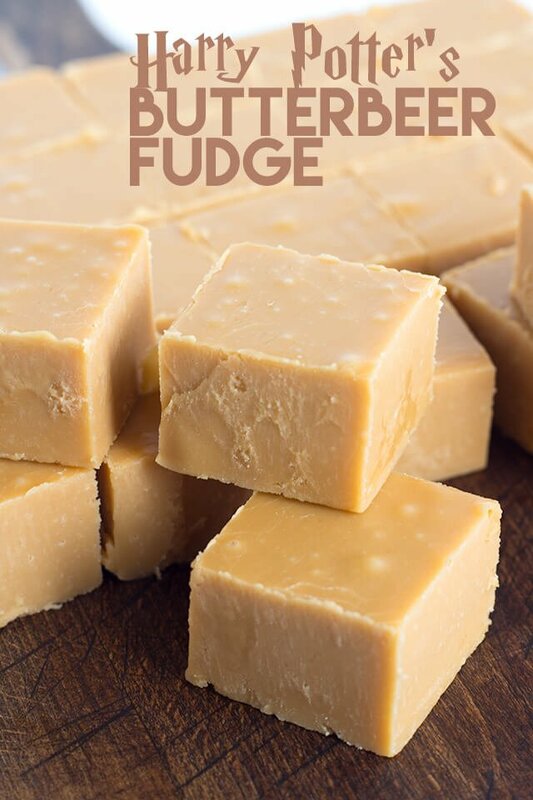 You can use honey or dark corn syrup as a substitute, but the flavor will not be the same. We made this cake today to taste-test for my son’s upcoming Harry Potter birthday. This is probably the most loved cake I have ever baked for my kids! Incredible! Any thoughts on cake pan size if I double the recipe? I’d love to feed the crowd with a single cake if I can. 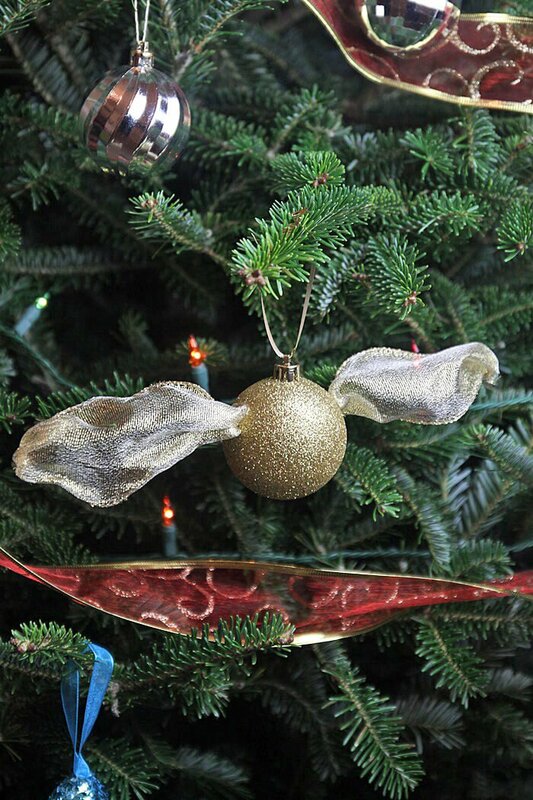 Love the smaller size to make for us at home where a little goes a long way. Thanks so much for sharing this! Hi Kellie! I’m so glad you all enjoyed the cake!! If you want to double the recipe I would probably try 10 inch pans. Any extra batter can always be put into cupcake tins. I hope that helps! Don’t forget to adjust baking times for the bigger pans, those cakes will take longer to bake. Good luck! Hello! I’m a HUGE Harry Potter fan! I cannot wait to try out this recipe. My only question is the Tbs mean tablespoon? Because must people use tbsp. Thanks! Hi, I’m glad you’re excited about this recipe! Yes, I use Tbs as the abbreviation for tablespoon. Good luck! 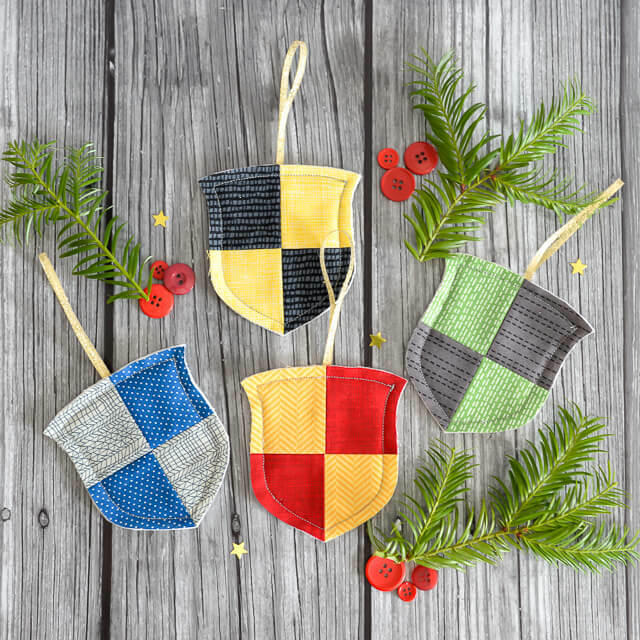 I am a huge Harry Potter fan and wanted to make this recipe over the holidays. I have a few questions for you. Did you use light or dark brown sugar? If I was to make this cake the day before, can you wait till the day of to add the sauce? I have never made a cake with sauce on top so I’m not sure if it would become soggy. Thank you so much! Also same question for the butterscotch sauce and frosting – what type of brown sugar and corn syrup? Thank you so much ! Hi Katherine, I use light brown sugar. You could definitely wait a day to add the sauce. You could even have the cakes baked and then assemble everything the day of. Good luck! 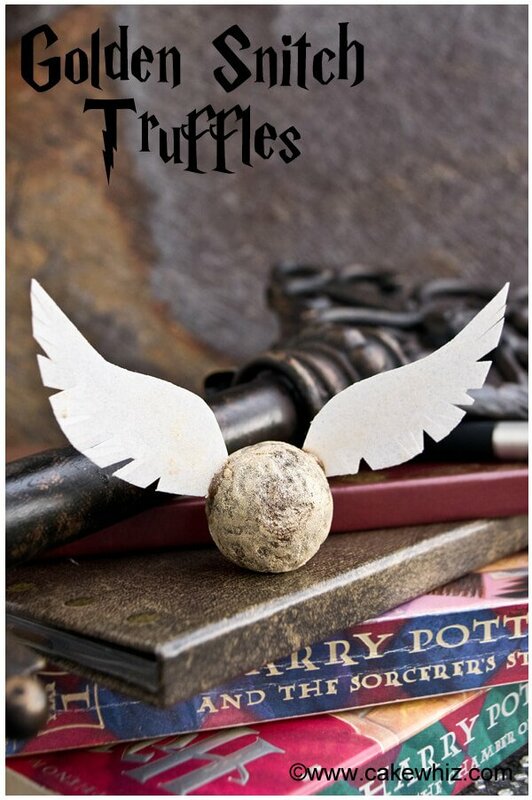 We just made this for my daughter’s 13th birthday which is a Harry Potter theme. We made an extra small one so we could taste it before the party in two days. OMG I seriously think this is the best cake I’ve ever had! Amazing!! You just made my day!! Thank you! I’m so glad you enjoyed it, and I hope all goes well for the party. Enjoy! Made this for my son’s birthday party and then brought the left overs to work. It was a hit! So freaking delicious. Thanks for the recipes! Yay! I’m so glad you liked it, and that your co-workers enjoyed it as well. Even though I used honey in place of mollases, this recipe turn out excellently well… It was all gone in minutes… Everyone loved it. Can’t wait to make it again… Thank you. I’m so glad you liked it! I’m sure the honey added a good flavor.